In the field of dentistry, much like the field of medicine, there are general practitioners as well as a number of specialties. Varying levels of auxiliary staff are also necessary to provide optimal oral healthcare for our patients. This article is designed to help the dental patient understand the parameters around these dental professionals and how the various roles work to deliver dental treatment. A doctorate level in Dentistry is offered as two different degrees: Doctor of Medical Dentistry or DMD and Doctor of Dental Surgery or DDS, depending on the university attended. There are a number of prerequisites that must be met in order to be considered for the program. A BS or BA degree to include all of the prerequisite courses such as biology, inorganic and organic chemistry, physics, art, English and math. Another prerequisite is passing the Dental Admissions Test or the DAT. The DAT is a measurement of aptitudes in Reading Comprehension, Perceptual Ability, Quantitative Reasoning, and a Survey of Natural Science. Following the first two years of a doctorate dental education, the written boards are taken; following graduation the candidate receives a DDS or DMD degree and must pass the clinical boards, and the ethics and jurisprudence test. Once all of these steps have been satisfactorily completed, a license is awarded to the dentist and the candidate is considered a general practitioner. If the candidate wishes, they can continue their education in one of several specialties. There are many arenas in which a dental education can be employed, all of which have advantages and disadvantages. A dentist could go into private practice, an associate position or contract work, the Armed Forces, education, research, or government-sponsored clinics. In the United States and Canada, there are nine recognized Dental Specialties. These are areas of dentistry whereby following graduation and licensing as a general dentist, one may choose to apply for and if selected, continue their course of study in a specific area of dentistry. This continued course of study usually involves 2-4 more years of training and/or a residency in the field of interest and upon completion, a MS (Master of Science) is granted here in the United States. (endo meaning “inside” and dont meaning “tooth”) is the specialty that treats the problems associated with the inside of the tooth through root canal treatment. The endodontist also performs surgery (known as an apicoectomy) on teeth that have been received a root canal treatment, but have not responded well and need further treatment to save the tooth. Today’s endodontists use microscopes that can view the inside of the tooth canals and they can more predictably locate all of the extra canals we now know exist, especially inside molars. Most of the root canal treatment done today is by use of mechanical rotary instruments that can more thoroughly shape and clean (clean meaning: kill bacteria) the canals. The use of lasers to further clean the canals inside the tooth are becoming a useful tool to increase the success of the root canal treatment; after all, as discussed in the article on root canal treatment, it’s bacteria from tooth decay or bacteria from death of the tissue inside the tooth that is necessitating the root canal treatment. Although general dentists are trained to do root canal treatments, some choose to refer these patients to a specialist. (ortho meaning “straight” and dont meaning “tooth”) is the specialty of straightening teeth (through braces) and involves 2-3 years of specialized education beyond dental school. Although some general dentists perform orthodontics, there are many cases that require the specialized knowledge of a dedicated orthodontist. Treatment to straighten teeth can involve just the teeth, the skeletal system, or both. Some treatment requires the retraining of the tongue, or the expansion of the jaw; some treatment involves oral surgery. To either pull out (advance) or push back (retrude) the upper or lower jaws (or both). In surgical cases the orthodontist works closely with the oral surgeon and the referring general dentist (a team effort). Although general dentists do orthodontic treatment, some choose to refer these patients to a specialist, while others refer difficult cases beyond the general dentists’ scope of expertise. Oral and maxillofacial surgery- this involves treatment from simple tooth removal, (extractions), biopsies, implant placement, to facial surgery (from injury to the facial bones). Oral surgeons therefore have hospital privileges and work closely with medical doctors in the field of ear, nose and throat treatment (ENT) and depending on the situation, plastic surgeons. Oral and maxillofacial pathology– this area of oral surgery involves the study, diagnosis and sometimes treatment of oral and facial related disease. Disease is meant to include cancerous tumors either benign or malignant, cysts, and developmental anomalies (development of tissue that develops outside of what is considered to be normal development). Oral and maxillofacial radiology– the study and radiological interpretation (the reading of x-rays and determining what abnormality is present) of oral and facial disease. patients with a genetic form of periodontal disease (very, very rare!!) Most periodontal disease is bacterial in nature and enabled by lack of homecare (daily removal of bacterial growth). (pedo- meaning “child” and dont meaning “tooth”) are specialists who treat children’s teeth and study an additional 2-3 years beyond dental school. Some general dentists will refer a young patient to this specialist due to behavioral issues or perhaps the scope of needed treatment is too great to handle in a general dental setting. In these cases, sedation or general anesthesia may be required to complete the necessary dental work. For this reason, most pedodontists have hospital privileges. They hold space for adult teeth, helping in the appropriate growth of the adult teeth. They help in the development of speech. They are involved in the appropriate chewing and digestion of foods (as are adult teeth). They help in the development of the jaws. The psychological nature of treating children impacts not only on their dental health but also their long-term attitude and willingness to receive dental treatment. The pedodontist is trained in all areas of the dental treatment for children. They may work with the general dentist who has referred the child for behavioral reasons; the orthodontist who may be trying to intercept a future orthodontic problem; or an oral surgeon who, along with the orthodontist, is monitoring the growth patterns of the child to determine the need for surgery. Prosth means “artificial replacement” and dont means “tooth”: this dental specialty treats replacement of teeth by crowns/bridges, dentures/partials, or implants. Some prosthodontists further their training in “oral and maxillofacial prosthodontics” replacing structures such as ears or noses lost due to an accidents, cancer, burns or disease. Therefore, the prosthodontist may be required as part of a medical team for the complete restoration of an injured patient. Training for this specialty is 2-3 years beyond dental school. This specialty involves the study of dental diseases: bacterial, viral, cystic, cancer, environmental, genetic and any other diseases that involve the oral cavity, head and neck. Further, dental public health involves social health policies such as water fluoridation. Again an additional 2 years of study is required. A general practice residency can best be described as a postgraduate program, usually associated with a hospital, during which a licensed general dentist spends a period of time in extended study following graduation from dental school. They work with patients, performing treatment under the supervision and direction of a number of specialists who regularly work in the hospital setting as instructors. The advantage of this type of program is in seeing more involved, advanced forms of dental disease and making treatment decisions with specialist instructors who have spent their careers treating more complicated dental cases, or medically compromised patients with complicated dental needs. The primary role of the Registered Dental Hygienist is cleaning teeth, taking x-rays, and educating the patient about dental disease. Cleanings can range from child to adult cleanings, to treatment of advanced periodontal disease. The license to practice dental hygiene in a clinical setting is usually a two-year commitment leading to a liberal arts or associate degree. If desired, a dental hygienist can seek a bachelor’s degree in Community Health or Education. Further, dental hygienists are now being trained to provide dental anesthesia (novacaine, and nitrous oxide/laughing gas). 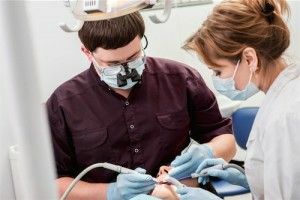 Due to the problem involving communities without adequate access to care, some states are offering additional training allowing dental hygienists to provide care that in the past has only been provided by a dentist. These hygienists are certified as Expanded Function Dental Hygienists. Depending on the state, a dental assistant can have a variety of duties. While some states do not require any education other than on-the-job training, others carry strict requirements that sharply delineate duties, depending on an assistant’s level of registration or certification and training. States with programs leading to registration (RDA), certification (CDA) or Expanded Function Dental Assistant (EFDA) carry duties that require more skill and responsibility. Assistants work only under the supervision of a licensed doctor of dentistry. Certification carries with it the recognition that one has reached a level of skill demonstrating extensive knowledge in that area. Accreditation in the American Academy of Cosmetic Dentistry, a highly respected recognition, involves an arduous process and takes about three years to complete. Many dental technicians are trained “on the job” and do not become certified. This does not mean they aren’t highly skilled at what they do as a dental professional. It simply means they have not gone through the process of technical certification by a teaching institution. In most states, laboratory technicians must work under the direction of, or written prescription from a licensed doctor of dentistry. In other states denture technicians can repair dentures and partials without the direction of a licensed doctor. This is dependent on the laws and statutes that govern each state that are written by each Board of Dentistry.